Inherent flow characteristics is determined under laboratory conditions by testing the valve flow versus valve lift or travel using a constant differential pressure drop across the valve throughout the test. The inherent flow characteristics for each control valve are published by manufacturers and they are standardized for a fixed pressure drop as defined by the use of the valve flow coefficient value, Cv. This could be regarded as the actual flow characteristics of the control valve because it is determined for each installation by the actual differential pressure drop across the valve when in service. In operation, the differential pressure across the control valve varies throughout the valve position due to the system characteristics. The above curves indicate the approximate percentage of full Cv that will be established if the control valve were operating with a constant pressure differential. This flow characteristic is designed to make the rate of increase of Cv proportional to the percentage opening of the valve. It is the flow characteristic most commonly selected for control applications because it compensates very effectively for decreasing pressure differentials as flow rate increases. This flow characteristic response from a valve is good for control because as seen from the curve above, it gives relatively small increments in Cv for the first 50% of stroke but still has good capacity as the valve opens at a faster rate after that. This characteristic also provides for high rangeability in a control valve since it provides fine adjustment of the Cv at low flow rates. The linear flow characteristic is simply a proportional relationship between the flow rate and valve travel. 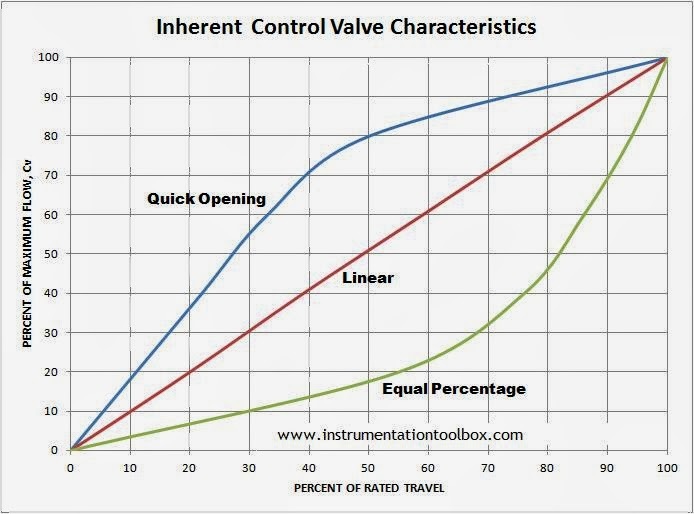 The linear characteristic will be a more desirable choice than equal percentage if the available pressure drop across the valve remains constant over the design range of operations. Control valves with linear characteristic are often specified for liquid level control where pressure drop is near constant due to the head of liquid. It could also be used for recycle pressure controls on compressors for the same reason that differential pressure remains constant over the operating load range. This characteristic provides the majority of the flow early in the opening travel of the valve. The curve is basically linear through the first 40 percent of valve plug travel and then flattens out noticeably to indicate little increase in flow rate as travel approaches the wide open position.